In the early 1970's, the company Travel Dynamics International was started up and since its foundation, the company had concentrated on high quality, educational cruises on small ships. They are not an owning company, but they charter ships from other owners for use within their fleet. Cruises with Travel Dynamics are not always fixed to a tight scedule, as there is always room for the captains of the fleet to explore and go beyond the chosen paths. In early 2003, they chartered a newly built ship from the Delaware-based company Explorer Maritime. This company had a ship built under the name of Orion at the Cassens-werft in the German port of Emden and this ship was the ideal choice for TDI. 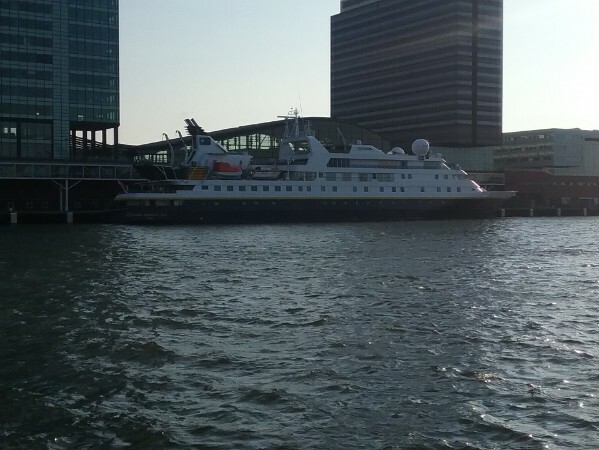 At the 8th of september 2016, National Geographic Orion visited Amsterdam for the first time during her maiden season in Europe. The ship had been built under yardnumber 30236 and she had been laid down at the 17th of june in 2002. She was to be a very small expedition-type ship, measuring only 3984 tons. She has a lenght of 102,70 meters, was 14,25 meters wide and her draught reached 3,80 meters. On her five passengerdecks, she has space for 106 passengers and 75 crew, within these numbers you can clearly spot that she was to be a high-end ship with a very high crew to guest ratio. Only one propeller is needed to steer this ship and her power comes from one MaK-design diesel engine. Her servicespeed is a modest 15,5 knots, but then she is not built for speedy maximum portnumber cruises. Orion had no sisterships, but she was built as a somewhat larger version of two earlier ships that had been built by the same wharf for a company named Sun Bay Cruises. Their Sun Bay was launched in 2001 followed by Sun Bay II in 2002. These 96-passenger ships have a measurement of just 2300 tons and originally operated around the Bahamas. The Sun Bay is now in service as Celebrity Xpedition for Celebrity Cruises around the Galapagos Islands and the Sun Bay II is currently a private yaught after she had been sailing also for Travel Dynamics International for a short while. Orion was designed especially for voyages in the Arctic and Antarctic and so her hull is ice-reinforced and she is qualified as an E3 Ice-class by Germanischer Lloyd. She has a very shallow draft and is equipped with bow and stern thrusters so she can reach places in remote area's and has a high manouverability in shallow waters. Inside, she is mostly decorated in blue, cream and brown colouring creating a very open and spacious feel. Very comfortable, especially for a ship of her size, without becoming luxurious. There is a large observationlounge with panoramic windows, located on the ships highest deck next to the well-stuffed library. Below, another lounge is there, also with large picture-windows overlooking the scenery she sails in. The ship has no formal nights and is very casual in style. The restaurant can seat all passengers and there is thus only one seating. On several days when the weather permits, there is also the possibility to dine outside as the whole menu will be available on deck. For passenger convenience, the ship also gives the possibility for service laundry, in-room cabled internet and public-area WIFI. Furthermore, the ship offers a state-of-the-art theater mostly used for presentations about the expeditions, an outdoor café, a nicely comfortable Spa area with mud-room, unisex dry-sauna and a small but well-equipped gym. There are only outside cabins, with large picture-windows overlooking the surroundings. Nine cabins do even have a balcony. They all have a comfortable sofa or armchairs to relax and there is a large desk available and a large amount of drawer space. For exploration purposes, the ship is equipped with 14 Zodiacs, which are inflatable boats, one of which has a glass bottom. Also there are kayaks aboard, next to an ROV (Remote Operated Vehicle) and the capacity to accomodate scuba-divers. Due to the connections between Lindblad and National Geographic, since her sailings started for Lindblad the ship sometimes has photographers from the National Geographic Society aboard, as well as onboard experts from this organisation. From april 2017 onwards, bar tab and tips for crew are included in the overall price for the voyage. As Orion, the ship was operated as said by Travel Dynamics International between 2003 ans 2005, mostly sailing cruises in the Arctic and Antarctic regions where she had been designed for. That said, she was also seen in other regions, most notably in the Amazone and even the Great Lakes of North America. In march 2005, the ship was leased on long term to Orion Expedition Cruises who operated the ship mostly in Australia, around Tahiti and in the region of Oceania. Her most notable event in this time was the rescue of Alain Delord, a round-the-world yaughtsman who had come into trouble south of Tasmania after severe weather where-in his mast was broken and damaged the hull of his ship. He had to abandon ship and was picked up by Orion at the 20th of january of 2013. 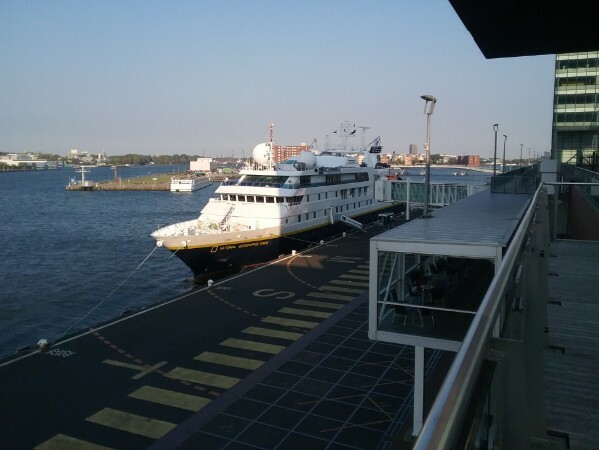 A few months later, on the 5th of march, Lindblad Expeditions had bought Orion Expedition Cruises and the ship was added to the fleet of small expeditiponships already operated by Lindblad. Originally, the intention was to keep sailing in the Oceania region and not much was to change for the ship under her new owners. Most notable change was the addition of the National Geographic prefix to her name, so from march 2014 onwards she was named National Geographic Orion. 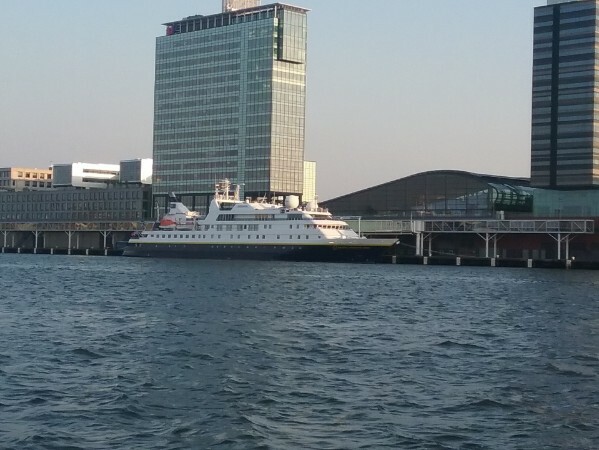 To everyone's surprise, in the beginning of 2015 Lindblad announced that the ship would be transferred to summer European cruises from the 2016 season onwards.